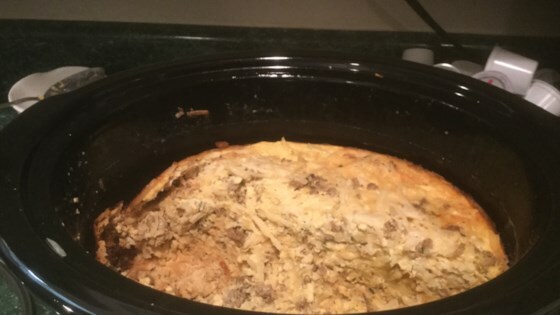 "A yummy breakfast casserole that cooks while you sleep!" Spray the bottom of the inside of a slow cooker crock with cooking spray to coat. Spread hash-brown potatoes into the bottom of the slow cooker crock to cover. Top with cooked sausage. Sprinkle mozzarella cheese over the sausage and stir. Beat eggs in a large bowl until smooth; add milk and beat to integrate. Stir mustard, salt, and pepper into the egg mixture; stream over the potato mixture. First time made it as written and it needed more flavor. Second time I added sharp cheddar as well as some green peppers... perfect, was a hit! It was good. Next time I'll probably add diced white onion. Turned out great. Add a little garlic salt for more flavor. I don't eat meat, but my fiance does and he loves this. I may try it with "fake" sausage--it smells heavenly in the morning when it's done and I'd sure like to try it out!